Farrington Court was good and the staff explained everything really well and I saw what I needed to see. The rooms were pretty standard. There were some transition spaces that I didn't quite like. There were units that have been put together which were a little bit of a concern for us. They had standard types of activities and gathering, pretty much like what every other place had. They had a beauty shop, areas where people could sit and chat, so it was nice overall. The staff is very nice. When we went into Farrington Court, there was a sign that said they were hiring LPNs and RNs and staff people. If they're hiring, there's people leaving. The community was fine, though. The people were fine, and the woman we dealt with was knowledgeable. She took her time and talked to us. The rooms were older but well maintained. The facilities appeared to be minimal. We saw the dining room and one of the game rooms. My mom absolutely loves Farrington Court, and she's really happy. She's in assisted living, and the people have been great. She does exercises twice a week and goes to Bible studies, bingo, and educational classes for her diabetes and high blood pressure. On certain days, you can have coffee with people who work there. My mom also participates in their luncheons, and they have a lot more activities. If she doesn't particularly like the food being served, they'll make whatever she wants. We went to Farrington Court and they were all great. The people who live there were really happy. They talk to you as you walk down the hall. The lady that took me around was very nice and very informative. Farrington Court was very nice. It wasn't very new, but the people there were nice. I had a very good meal there. There was a common area with bookshelves where they can play cards and board games with other people. The staff was very nice. It's a little crowded and didn't have much of a view. It's also a bit more expensive than the other places we've visited. Thank you Frank for taking the time to visit Farrington Court and writing a review. Yes we are a seasoned building. We may not be the youngest or cheapest in the area but we do have a good value and are well known in the community for serving our seniors. Within the last 24 months we have made many upgrades to our building including remolding our lobby, replacing carpet through out the building, new doors to all the apartments and installed a high tech alert system for our residents safety. I liked the people at Farrington Court and it looked good, but it wasn't diverse enough for us. My mother-in-law is Filipino and there were no Filipinos living there. The staff who showed me around was very nice, very thorough, explained everything, and gave us a great tour. I didn't have any issues at all. I was very impressed. It was very clean, they had done renovations, and it was in really good shape. Everybody likes Farrington Court. They have restaurant-style dining where you can come in anytime between 7:00 and 8:00 at night. It's a limited menu, but you don't have to come in at a set time. I have two friends there that like it. I had lunch of rib steak which was very good and cooked perfectly, nice little salad, and onion rings. The service and the food were very good. It's an older place and sometimes you get a little whif of what smells like wet wood, but other than that I can't see anything wrong with it. I've visited Farrington Court on several occasions and was always greeted by the friendly helpful staff. This facility is for seniors 62 and older offering good sized apartment homes amidst a lively and very active retirement community. The convenient location offers residents access to shopping, movies many outdoor activities, including a golf course less than a mile away. A big positive is the dining room I believe it is open from 7 am to 7 pm and served restaurant style allowing residents to eat to their liking. This style of dining is great for socialization and is a great benefit to residents. I liked the atmosphere of the dining area. Oh, let me not forgot all the fun things offered at Farrington trips to Ocean Shores or beautiful Mt Rainier. I like the fitness programs offered stay fit with Zumba or the walking club. Residents can enjoy bean bag baseball or penny poker and pinochle. I was amazed at all the fun social and recreational activities there available at Farrington Court. The library is pretty awesome you can get lost in a book and spend an afternoon in the library. Pets are welcome that is an excellent thing for seniors who are alone. The apartments are a tad on the small side but do feature full-size kitchens. Hallways in each building are narrow, but this is because the buildings are older. You will find charming decor it is on the traditional side. It is also nice and gives peace of mind that there is a 24 hour RN that lives on site with two additional LPN's on each of two shifts. There is also emergency pulls in each room this gives added security and peace of mind. The gardens at Farrington Court are pretty awesome. It is nice that residents have an outdoor area to go and enjoy. There seems to be great staff retention. The staff is always eager to please the residents are very friendly, and they called residents by their name it was awesome to hear. Apr 09, 2013 | Reviewed by My grandma Rocks with the Best! This community rocks!!! My Grandma went rock climbing with Sharon and had a blast!! Thank you for making my Grandma young and hip!!! Farrington Court is the place to be. It has everything a senior retirement community should. It is affordable, beautiful, comfortable, clean, friendly, and much more. I would recommend Farrington Court to everyone who is still young and mobile that is able to participate in activities and go on adventures like the Tulip festival and the horse races. They have awesome staff who are always friendly! Tons of activites as well for everyone to participate in!! Farrington Court is an affordable community that allows me to live life independently as long as I can. It is close to shopping, the theater, the senior center, and many other activities I enjoy like the park. My family also lives nearby so they visit frequently. They are always welcome here and they love to come for dinner. The meals are amazing and to rave about. Farrington Court is where the heart is. They provide good care and service to the elderly. They have fun events that are open to the community. Farrington Court has amazing food. Their staff is to brag about. Farrington Court is a home with family. I wouldn't want to live anywhere else. Farrington Court has such a wonderful staff and that homey atmosphere always makes me feel that this is a fun place to live in! I love living at Farrington Court. I have lieve at FC for the last 6 years. I like the food and the programs, the staff is also great! My Mom loved living at Farrington Court. She loved the bus trips the staff and everything about the community. I have been to Farrington Court many times and know someone who lived there. She was very pleased with all aspets of the facility. Very friendly staff, excellent food and lots of things to do. And they were very responsive in an emergency. It is a great place to live. What a wonderful environment! Many happy outings and events. The staff are very giving and caring. Residents are happy and really enjoy the functions held there. I wouldn't mind living there myself! Farrington Court in Kent Washington is a exceptionsl community. Many friends and neighbors move from their larger residence to Farrington Court because it is close to downtown shopping, it is served by the shopper shuttle in addition to having their own van for transporting residents to doctor, dentist snd therapy appointments. The grounds are well maintained and the food is very good. There is a private dining room for residents who wish to have family events there. Welcoming, clean and helpfuol staff. My parents moved to Farrington 6 1/2 years ago. We were impressed immediately with the kindness shown to our family by the staff. I was a burdened caregiver and this decision was difficult to make but my mother felt that Farrington had everything they needed for this stage of their life and to help me with my load. My father had been dealing with being left debilitated by a stroke and the staff helped her to keep her and his spirits up during a difficult time. I was glad for the support then and after my fathers death. My mother bloomed and began a new and enjoyable life participating in the the functions provided by Farrington. This is such an important part among so many. From going to in-house games to outings, keep their spirits alive and the people living in the community as well as staff support each other in a way that family are not able to. Sure, my mom has minor complaints such as food related issues (meat toughness and sometimes slow service in dining room) but Farrington does their best to work on any issues related to making things more efficient and comfortable for the residents. The more games and things provided to keep residents busy, keeps them happy and relieves the guilt burden from family members so maybe that might be my suggestion if I have to provide one. My mother told me she hopes she never has to leave Farrington and I as a daughter feel the same way. I can't imagine what things would have been like for my mother if not for Farrington as she can enjoy life at 96 and keeps on "living" everyday with quality. As far as my rating number goes, I always feel there is room for improvement and I am sure Farrington will continue to do that but our overall experience is positive and have recommended them countless times. I like all the programs that they have to offer, the food is great and the people are wounderful! I love that the dining room staff calls Bingo on Tuesday and Friday nights,Those dining room servers work hard. Farrington Court is a great place for seniors I enjoy Bingo and penny poker. The food is great and they have the best hamburgers in the city of Kent. I like that they have special family dinners every month that are always fun and the food is great!!! Farrington Court is well managed by Michelle Worcester. She has a deep concern for the residents and makes sure there are plenty of activities and that they are well cared for. The facility is well maintained and the meals are good and nutritious. I teach Bible Study on Thursday Mornings. I love the ladies + the staff. They are very loving + Caring + truely have a concern for the residence. They put on fun events + will try to get everyone involved. this would be the place I would put my family. I have visited with Zennea Nelson (a volunteer) & love everything here at Farrington Court. My parent used to live here also. The Best. Lots of activities, dinners out, trips etc. Nice food, always something to do. Nice rooms. Family always welcomed. the staff - everyone of them, from office to the delightful cleaning lady are a pleasure to greet. the residents are a happy & a treat to meet - atmosphere is up & always cheerful! I get my hair done at Farrington Court by Linda and she is amazing so kind and Loving. I always Love to walk into the Building the flowers are always over the Top and it just Brightens your Day all that color! Its Warm & Bright Friendly community. I love living at Farrington Court. The people are so friendly and we are served three hot meals every day. Try to find something better for this price. You can't. Good attention to spots needing repairs and help with installing things owners need help with (burned out light fixtures in ceiling), etc. I like that all the staff knows your name when you walk in the front door. The building and the grounds are very well kept. I was delighted to be greeted by the resident welcome committee during my tour of the community. I liked the private court yard this has a park like feel with a paved walking path and extensive gardens that follow the path. I like that they have a town car and a shuttle bus available for the seniors to use. I was also very pleased with the options of food choices that are available in the dining room. The one bed room apartment that I looked at was spacious and bright, one of the things I liked best it had a full kitchen. I enjoyed the tour of the community along with the friendly staff and the residents looked very happy and active. I am pleased with my care - food and ect. Everyone is friendly & seems to do things to help you file at home + feels good to be able to live here. I have lived here almost 6 years. Variety & Quantity ok Presentation could be a little better as meal time is a highlight for many residents. I love the community staff they are very helpful. My apartment over looks the city. I moved from out of state to Farrington Court and when I arrived at Farrington Court everyone already was calling me by name! I have had several of my close friends who have moved into Farrington Court and when they needed care the Health & Wellness staff and the Nurse took very good care of my dear friend Arvin. Arvin loved Farrington Court every morning he was up with the roosters making his special cup of Joe, he would check in with Amy at the front desk every morning giving her the berries in his loving way it was a ritual that he loved to do. Every Wednesday we would meet up with Arvin at 7:00AM for our church breakfast and the front desk would great me by name and informs me that Arvin was on his way. As time passed over the next year Arvin’s cancer started taking over and he was afraid that he was going to move. The Farrington Court staff and his family went above and beyond to meet his every wish. Our church was so happy for Arvin and his Family that he would be able to stay at Farrington Court with his friends. The Health and Wellness staff and the Nurse along with Hospice made every day special for my dear Friend Arvin. Arvin enjoyed Farrington Court very much it was at times the highlight of his conversation at church, he enjoyed the fact that he didn’t have to cook or do the dishes. Thank You Farrington Court for taking care of one of my closest friends and for providing him with dignity and respect and for filling his wishes. Mar 13, 2013 | Reviewed by Tricia Stampin Up Friend! The personal touches at Farrington Court are out of this world!!! I first want to start off with they make these handmade Christmas cards that are just out of this world that they send to residents and their families and to top it off they have each staff member sign each and every card, My friend has all those handmade cards for every year she has lived at Farrington Court and it means so much to her, they also have special tree decorations each year with the residents name on them again that personal touch. It brings a smile to my face when I was told about Michelle the Executive Director and Melissa the Health & Wellness Director dressed up like M&M’s and they went to visit resident in hospitals. The staff goes above and beyond to make everyone feel special. I enjoy coming to the building it’s full of fun and energy and they are always doing something new and interesting. Farrington Court is a lifesaver when it comes to helping a family in crises. Our family was besides ourselves when "Grandpa" could no longer take care of himself. We looked at several communities but just couldn't seem to find one that seemed right. Once we walked into Farrington Courts lobby we knew he felt that this was "home". The community is quaint, cozy, and reminded my grandfather of his roots in Nebraska. Additionally, the dining services are amazing - and Chef Brennan takes pride in making sure the food is nothing less that wonderful! The staff is so gentle, caring, and the activities are bar none. Grandpa keeps so busy and has made so many friends. Our prayers have been answered. We love Farrington Court. It has felt like home from the moment we walked in. The staff knows & always uses first names w/residents. Always friendly but professional. Farrington Court in a top the line place to live + I would do highly recommend it to anyone. The tone is set by Manager Michille Warenster. It is warm + friendly, the building is well kept + radiates a beauty of being cared for but also deeply cared about as individuals & their contentment + care is top concern and staff does their job. Farrington Court is home! The residents are friendly and happy. I've made good frinds since I moved in. After checking on 10 retirement homes this is the one that I knew immediately that it was for me. I am thankful that I found it. I have lived at Farrington Court for over the past three years and am more than happy with my choice of a retirement community. I am very active in the doings of Farrington Court and Really enjoy the many trips + outings that they provided. We do the usual (shopping, lunch and Sight-Seeing) but the unusual happens also (river rafting on the Skagit to watch for eagles, rock climbing at REI and zip lining. Most important part of my enjoyment is in the large amount of choices that are available to me. This is not a sit here and eat at 4:30 type of place. I decided what is right for me. Please continue your excellent staff, facility, and food. Five stars. This place is run more like a five star Hotel than an adult living facility. I have known many residents over the residents over the years, and have never heard a negative comment. The entry area is bright + cheery, welcoming. Director + staff are upbeat, active, + positive + involved in the community. I have lived at Farrington Court for over 12 years. It has always felt like home. The staff makes it feel that way. I have not missed my home of 50 years. So glad I moved to Farrington court in Kent, WA! Every time I come into the door of Farrington Court I'm always greeted with a smile and by name, I’m always amazed that the Front Desk staff knows me by name. The events that they put together for the residents and the families is just amazing, a couple of my favorites have been the Oktoberfest with a real German band and the monthly senior pancake breakfast these are no ordinary pancakes these are pancakes that are topped with fresh fruit of your choice, homemade whip topping , warm maple syrup!!! The best part of the breakfast is that’s its free every month. The Chef has a heart of gold, he remembered that my wife has a special Gluten Free diet and he went out of his way to make her a special lunch and tell her about several local Gluten free specialty stores. I also appreciate that they have all day dining so matter what time of day it is we can get a meal in the dining room with our family and friends. The community is always warm and inviting the staff is always friendly. This is a great place. Sometimes the meals are not the best such as dry meat or not enough on guest plates or odd choices such as hotdog or pizza for dinner. Most of the time the food is very good. This is the best place for my mom. She is very happy here. Like that the Dining Room is open 12 hours per day & you do not have to take the "special" But can order alla carte We love the food! My Grammy lives here. She loves her new home. She has so much fun going to the casino and going shopping and she went river rafting. I love visiting her every weekend because the food tastes so good and all the people there are so nice and friendly and they really care about my Grammy and all the people that live at Farrington Court. Mar 11, 2013 | Reviewed by Caring Friend of Dottie!!! I have been volunteering at Farrington Court for the past 5 years. I have loved working with the residents, staff and employees. One Year I was The Farrington Court Easter Bunny, I have helped out at almost every summer event. The community has a wonderful home like feeling and the staff is always so warm and friendly. The Residents have a Garden club, and those ladies are over the top!!! The front porch of the community looks like it should be on the front of a gardening magazine. The staff are friendly, courteous and obviously care about the residents. A variety of activities are available for those who want to participate in them. Apartments are spacious and well organized, and are always thoroughly cleaned and well maintained by efficient and friendly staff members. New residents move into fully refurbished apartments. Dining room staff always treat the residents as special guests and desire to satisfy each one with choice of entrees and special requests. Meal choices are prepared well and include all the food groups with an eye towards resident health. I am delighted that my Mother enjoys living at Farrington court. My great grandma lived at Farrington Court for a few years. She has recently passed away due to health complications. But the residents and staff are the best around. They are genuinely caring and helpful people. Chef Brennan and the restaurant staff are phenominal. They have 5 star dining at Farrington Court for sure. Che and Diana that do all the activities and planning are so creative, always punctual and have the best outings I have ever heard of for the elderly. They deserve to win this award. I will be sure to have the rest of my family vote too. Mar 04, 2013 | Reviewed by Shelley A true Friend. I have enjoy every visit that I have at Farrington Court the staff is always so warm and friendly. When I come to visit my friend at Farrington Court she is always doing something in the community and she is always excited to tell me about what is going on for the week. I'm glad that my friend found such a wounderful place to live and I'm thinking of moving in when I get to be that age. Farrington Court is a friendly and inviting living environment for Seniors. The staff is happy and kind.Piano music is played in the lobby by one of the residents most evenings and many enjoy watching TV together on the big screen TV in the common area.The wait staff in the dinning room is polite and professional.The facility itself is clean and comfortable. The best way to get to know a community is by scheduling a tour. See the facilities, meet the staff and residents, and get a feel first hand what it's like to live at Farrington Court Assisted Living. 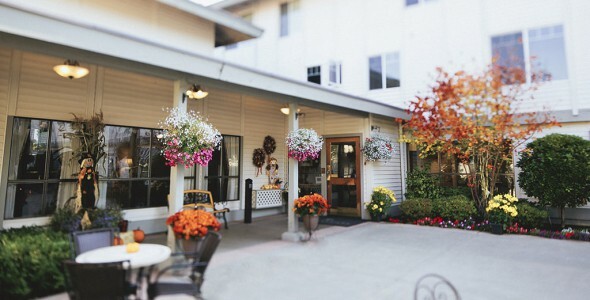 Located in the heart of downtown Kent near Kent Station, the Kent Senior Center and less than 20 miles from Seattle, Farrington Court is a vibrant retirement community offering both independent and assisted living accommodations and services. Live here and let our friendly, devoted and professional staff look after you and cater to your every need! Farrington Court is managed by Stellar Senior Living, a senior housing provider that oversees communities in multiple states in the west. Spacious accommodations are available in a selection of studio, one-bedroom and two-bedroom floor plans to suit a variety of lifestyles. All apartments come equipped with full kitchens, in-suite climate control, private bathrooms and expanded cable television. Our beautifully appointed two-story building is home to a billiard table, card room, screening room, library, bistro and gift shop for the convenience and enjoyment of our residents. We also serve three freshly prepared meals per day in our elegant, formal dining room with a private dining area available for celebrating special occasions with family and friends. At Farrington Court you can enjoy peace of mind knowing that our highly trained staff are available around the clock, twenty-four hours a day. If the need should arise, we are there to assist you and help you solve any problem or issue that is of concern to you. Plus, every one of our apartments comes equipped with an emergency communications device and a daily check-in system. For added comfort and convenience, we provide weekly housekeeping and linen services as well as regular shuttle service in and around town. A full-service salon is also located right on site so that you can always stay looking your best. To relax after a long day of fun, enjoy a massage from one of our on-site therapists. At Farrington Court, we offer it all - food, fun, friends and more! Come take a tour today and see retirement living at its best.